Proliferation indices of SU-pcGBM2 cells exposed to plain medium (aCSF) or active conditioned medium generated in the presence or absence of pan-MMP inhibitor (BAT). ARPE-19 cells were seeded on Millicell inserts for growth to form the monolayer. Monolayers were treated with or without recombinant HIV-1 gp120 glycoprotein during the last 2 days of cell culture. Some samples were pretreated with anti-DC-SIGN antibodies or GM6001 before incubation with gp120. A, the TEER value was measured. B, the paracellular permeability for FITC-dextran flux was assessed. Date represent mean ± S.D. *, p < 0.05; **, p < 0.01; ***, p < 0.001. Ω, ohm. 1,10-Phenanthroline is a classic chelating bidentate ligand for transition metal ions that has played an important role in the development of coordination chemistry. It is an inhibitor of metallopeptidases. B) Representative immunoblot and quantitative analysis of the effect of SB-3CT on the decrease in claudin-5 (25 kDa) and (C) AQP4 (35 kDa) expressions induced by MDMA at 1 h (n=4-6). 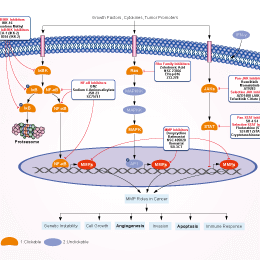 (E, F) Uev1A mediates negative feedback of NF-κB signaling pathway is dependent on TACE activity. Forty-eight hours after transfection, the cells were pre-treated with BB-2516 (20 μM) for 1 h, followed by TNFα (40 ng/ml) treatment for 2 h. Cell was fixed and stained with antibodies against HA and p65. The same cells were also stained with DAPI to reveal nuclei. White arrows indicate UEV1A-overexpressed cells. (F) Quantitative analysis of the experiments shown in (E). Percentage of cells displaying nuclear p65 is shown for UEV1A- overexpressed or vector-transfected cells. Each sample contains about 1000 cells. The significance of differences was assessed by two-tailed Student's test (***P < 0.001). NOB modulates Cps1 mRNA and protein expression. a Total protein extracts were prepared from liver samples collected from the four diet/treatment groups of wild-type mice at the indicated circadian time points (n = 3). Western blotting analysis was performed using anti-CPS1 antibody. RC regular chow, HFD high-fat diet, Veh vehicle, NOB Nobiletin. The results shown are representative of three independent experiments. See Additional file 1: Figure S1A for quantitative analysis. b Immunohistochemical staining of CPS1 in liver sections from mice with the indicated diet and treatment at ZT2. c Real-time RT-PCR analysis of Cps1 in liver samples collected as in (a). Data are presented as mean ± SEM (n = 3). Two-way ANOVA with Bonferroni post-hoc tests shows significant statistical differences between HFD.Veh and other three groups (p < 0.0001). d Western blotting analysis of protein lysates of liver samples collected at ZT 6 and 18 from mice with the indicated diet and treatment (n = 3). HPD indicates high-protein diet. The images shown to the left are representative of three independent experiments. Quantitation of Western blots was carried out and the results, presented as mean ± SEM, are shown in the lower panel. Two-way ANOVA with Bonferroni post-hoc tests, RC vs. HPD, ***p < 0.001. e Real-time qPCR analysis was carried out using total RNAs extracted from the liver samples described in (d). The results are presented as mean ± SEM. Two-way ANOVA with Bonferroni post-hoc tests, RC vs. HPD, *p < 0.05.